Occasionally there’s no better way to spend an evening than sitting down around a table with friends and family, having a few drinks and playing a board game. That stands particularly true when the game is something new. Every player goes into the game trying to learn, meaning everyone is that little bit more focused, that little bit more bewildered, and tactics have to be picked up along the way. Although I wouldn’t call any of us board game connaisseurs, this wasn’t the first time we’d learnt a game from scratch of an evening, nor presumably the last time we’ll be up past midnight trying to play one out! The Settlers of Catan advertises that it can be picked up in fifteen minutes, and with a bit of concentration there really is nothing too complicated about it. The object of the game is to score 10 victory points, which can be gathered in a number of ways, but the key to all of them stems from the same basic root. The island of Catan is divided into various regions or ‘hexes’, each representing a type of landscape which will produce a certain variety of good. Precisely which of these regions will bear fruit on any one turn is determined by the throw of the dice, adding that little element of luck which thankfully doesn’t marr any feeling of player involvement in this game. Placing your settlements and roads wisely should ensure a decent windfall of the produce from the dice throws, and it isn’t necessary to be in control of the dice in order to profit from a roll. Using various combinations of goods produced, a player can expand his network, building more settlements and roads, and creep towards that victory point tally. These elements alone would make for a pretty decent game, as one which would require the triumph of strategy over the fortune of the dice. But designer Klaus Teuber adds an extra couple of aspects which add the icing to the cake. The various options open during the building phase of the game require various combinations of goods to be collected, as a result of which players often find themselves in a situation whereby they are short of one item or another. The game allows for a stage of open bartering between the players, akin to that which you might find used ad hoc in any other game, but which given the prevalence and even necessity for progressing in the game, opens it up to all sorts of swindling and conniving to get what is required. On top of all of that is the shady figure of the robber, activated on the play of a card or the throw of the dice, who not only decimates the supplies of anyone hoarding goods, not only prevents any hex he occupies from producing goods, but also enables players to literally steal cards from one another. No man is an iland, intire of it selfe! 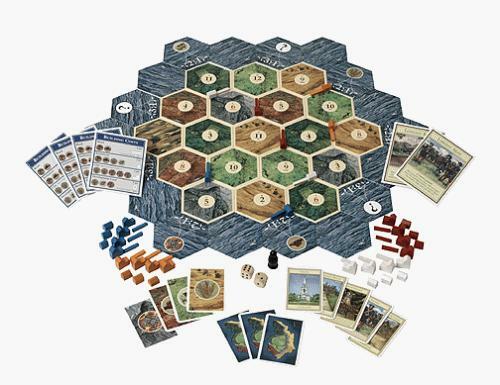 Overall, The Settlers of Catan is an excellent combination of luck, strategy and player interaction, which is neither complicated nor particularly time-consuming (typically the first attempt will no doubt be twice as long normal). It is perhaps unfortunate that one of our previous favourites has been Puerto Rico, a game that also comes highly rated (although not a winner of the prestigious Spiel des Jahres) and in many ways develops upon the elements involved in Settlers. 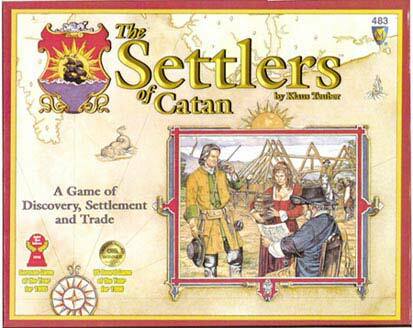 But where Puerto Rico is a much deeper strategy game, requiring players to focus on their own ‘islands’ and indeed on their own games, Settlers is at once less-involving through its simplicity, and more-involving in its player interaction. Whilst the former removes any real external elements of luck and places the onus on players to make their own, the dice in Settlers could have your strategy in tatters, as the little black figure makes his way over to your end of the island. The Settlers of Catan is the extrovert’s Puerto Rico. If you prefer to be in control of your destiny and left to ponder your own strategy, then Puerto Rico is definitely the choice, but if you want a simpler, more involving and more vocal game, my suggestion would be that you really can’t go far wrong with The Settlers of Catan.